In total, 30,563 advertisers spent USD 106 million sponsoring the keyword group consisting of 2500 keywords via U.S. Google Search Ads for Desktop and Mobile from October 15 through November 15. Far fewer advertisers, a total of 6,091, spent USD 22.3 million sponsoring the keyword group via Product Listing Ads on U.S. Google Desktop/Tablet during the same period. 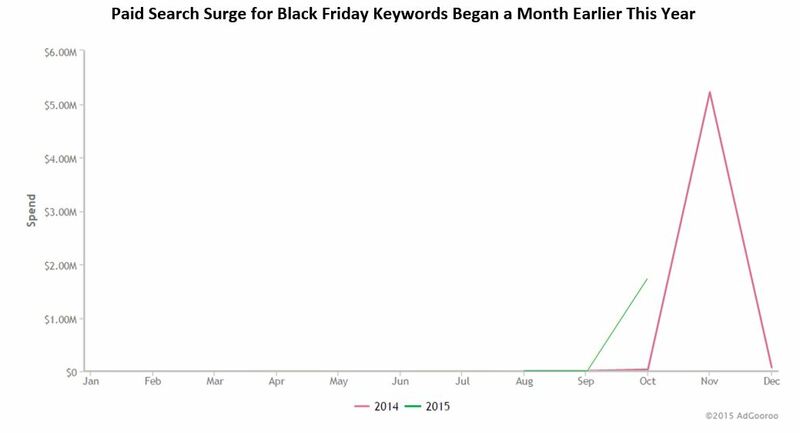 The surge in search ads for Black Friday Keywords a month earlier this year with advertisers starting to spend a months earlier than last year, on September 27. 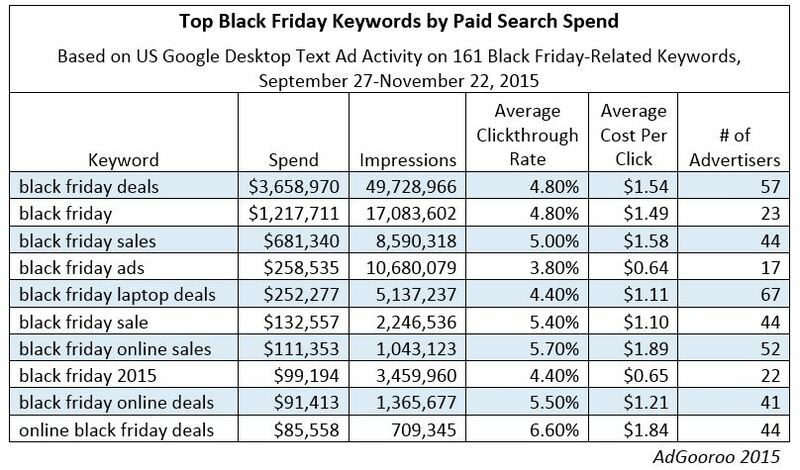 Target is the leading advertiser for Total Spend on Paid Search and for share of clicks. 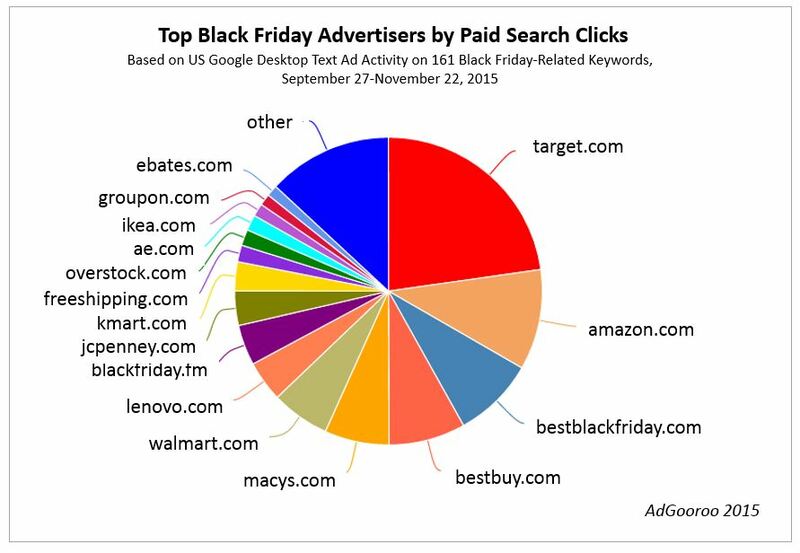 Online Black Friday Deals and Black Friday Online Sales are the keywords with the highest average click-through rate. PLAs space is less crowded with five retailers leading click-share of advertising. 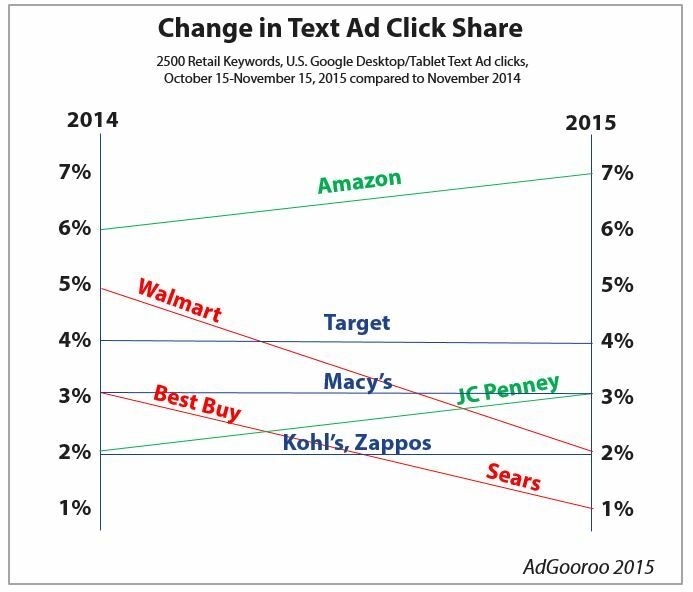 Walmart and Target both led with a 7 percent click share. 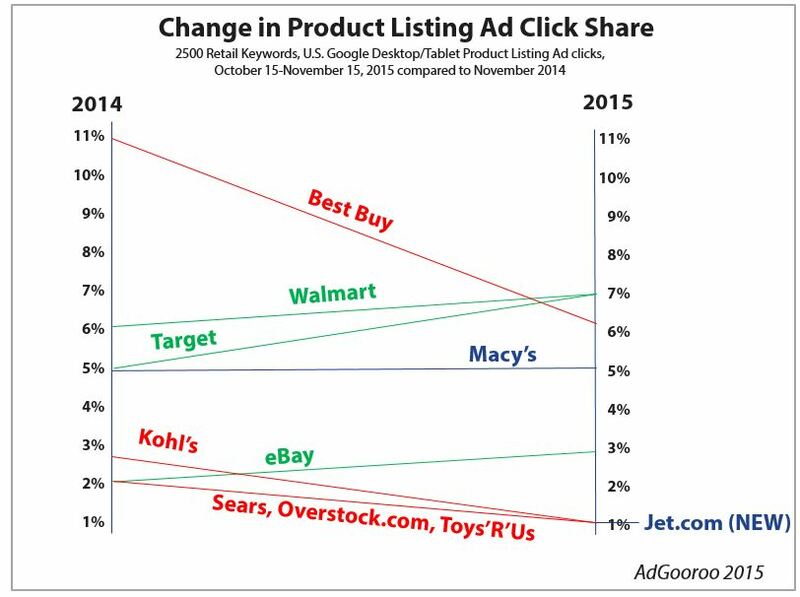 Walmart increased its click share from 6 percent in November 2014 while Target increased its click share from 5 percent last year. eBay also increased its click share, from 2 percent in 2014 to 3 percent this year. 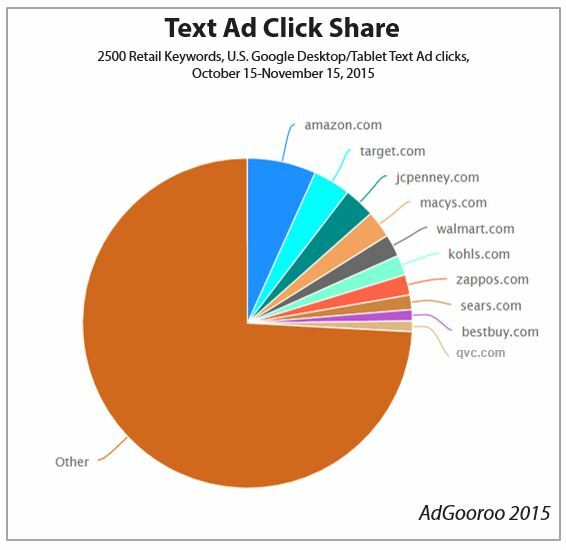 For impression share, Amazon.com, leads with a 10 percent share of voice by impressions on the keyword group, Target ‘s impression share at 7 percent for impressions is the same as Click Share, and Walmart at 2.2 percent impression share. 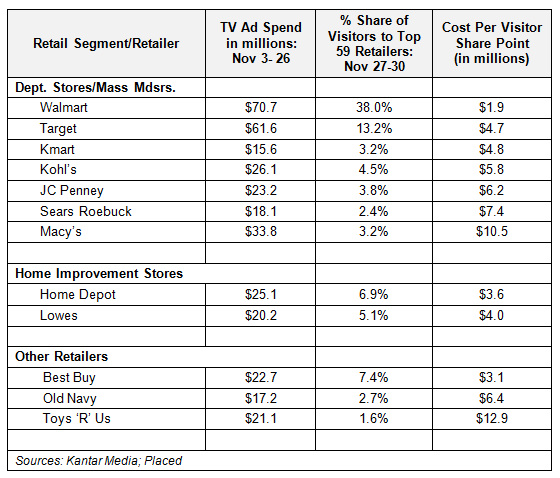 An analysis from Kantar Media for 2014 ad spend, with a syndicated research carried out by Placed with an opt-in panel of smartphone-enabled consumers to track their locations and the retail stores they visited from Thanksgiving Day through the following Sunday.For in-store shopping Walmart was seen as the most efficient advertiser with the least Cost Per Visitor. 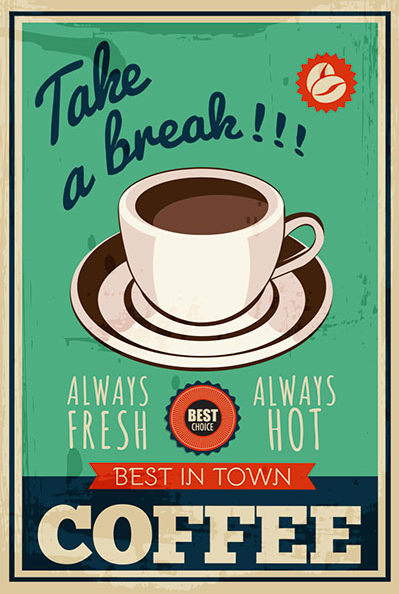 Posted in Advertising, Insights, Retail, Search. Tagged advertising, Amazon, Campaign, Google+, Retail, Search, Target, Walmart.